Keep your data secure and make sure it doesn't fall into the wrong hands. You deal with a lot of sensitive information about your business and customers everyday. This information can't afford to go into the wrong hands and compromise data privacy. Your CRM data should be accessible only for people who work on it, and not just anyone even in your office. Of course Zoho CRM comes with very strong data sharing settings. But to be even more secure, you can add IPs from which your Zoho CRM account can be accessed. Logging in through any other IP will give an "Access denied from this IP address" alert. This gives you an extra layer of security. As the administrator, you can select which users, groups and roles you want to give access to. 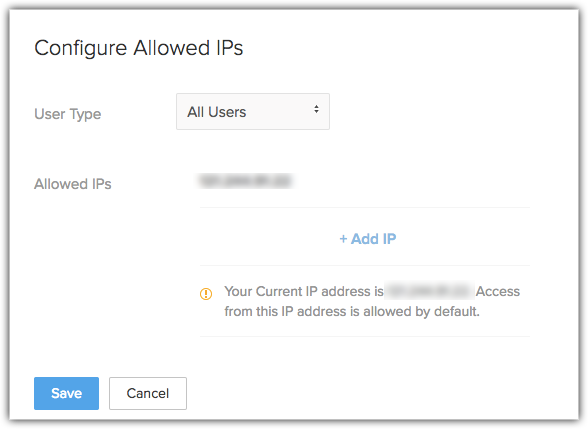 Once you've selected the users, add the IP addresses that they can access. This could either be a Static IP, an IP range (with Network IP and Subnet Mask) or you can choose from IPs that have already been added. So go ahead, keep your data secure by adding allowed IPs and choosing who you want to give access to. You can read more about adding and removing IPs here.